NJBHLP has acted as acquisition advisor to the NewCo owner of the 50 bedroom, three star Draycote Hotel, which changed hands in February 2019 in an off-market transaction. The property enjoys a prominent roadside location, shown in photo, adjacent the A45 trunk road, linking J17 of the M1 motorway, with Coventry and Birmingham, close to Rugby town centre. The full-service hotel includes restaurant, bar and five function suites; the 130 acre site is also home to the 18 hole par 71 championship Whitefields Golf Course, incorporating its own golfers complex and bar. Commented Nick Barber of NJBHLP, "It is quite unusual nowadays to find such a multi-faceted corporate business, yet still offering new owners the opportunities either to personalise or to add a brand. 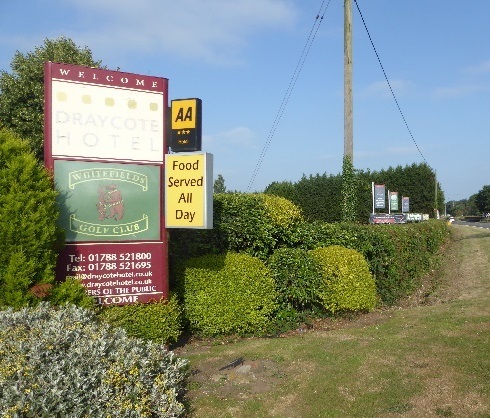 With golfing members and societies to consider and healthy forward function bookings for Draycote Hotel, this quietly conducted transaction was the right deal for all parties". 2018 saw NJBHLP offering its 'corporate hotel property advice, UK nationwide', into a seventh year, from Gosforth to Gillingham and Scarborough to Swindon, extending to Humberside and Ipswich in the east, Exeter and Worcester to the west, with diverse London area projects in Camden, Dagenham, Kingston, and others elsewhere. Many projects were confidential; where permitted there are mentions in the News Archive. Aggregate UK provincial hotel occupancy held at 76% (source PWC), whilst the country's largest hotel brand, Premier Inn, advised an estate wide 80% within the Whitbread interim results. It is generally reported that UK hotel trading was steady in 2018. Meanwhile, my running enjoyed a largely injury free renaissance, with a first marathon in two and a half years completed in Chelmsford in October, preceded by two 'halfs' and two tough northern fell races, within an enjoyable training programme. A place in London 2019 beckons at the end of April, albeit there is a 'hamstring' to deal with. Again, best feet forward and wishes to all for 2019.